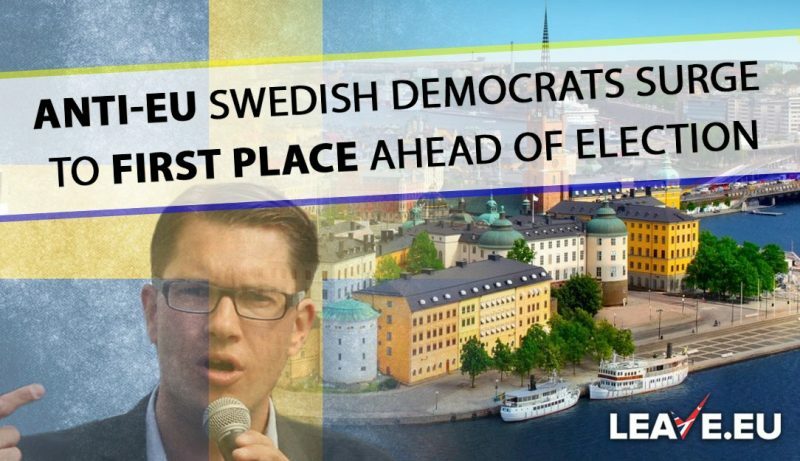 A new poll out of Sweden shows that support for the leftist ruling party is collapsing while the anti-Muslim migration, Euro-skeptic Sweden Democrats Party is tied for first place with the ruling Social Democrat Party ahead of the national election in September. Breitbart The poll, conducted by polling firm YouGov and released this week, puts the populist anti-mass migration party at 23 per cent, tied with the Social Democrats for first place, Metro reports. 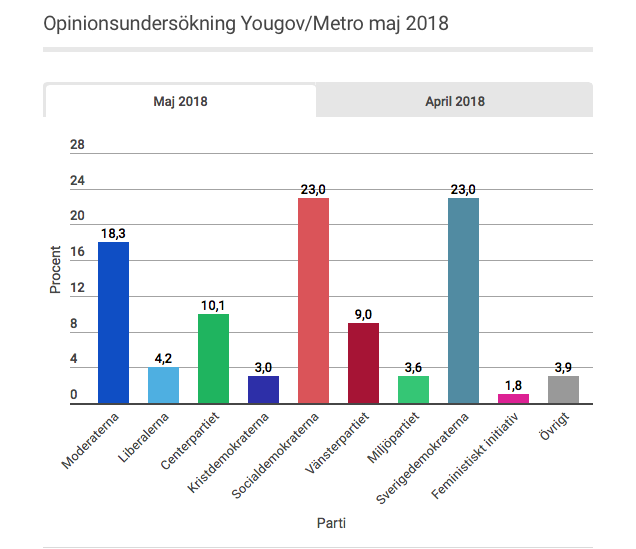 The surge in support comes after a leaders’ debate in which the Sweden Democrats leader Jimmie Åkesson dominated on the subjects of law and order as well as mass migration, winning the debate overall. Sören Holmberg, professor of political science at the University of Gothenburg, commented that despite the Social Democrats’ attempts to put out a tougher migration policy ahead of the election, the Sweden Democrats (SD) were still remaining strong with voters concerned with migration. “It seems to be hard to win back voters from the SD,” Holmberg said. 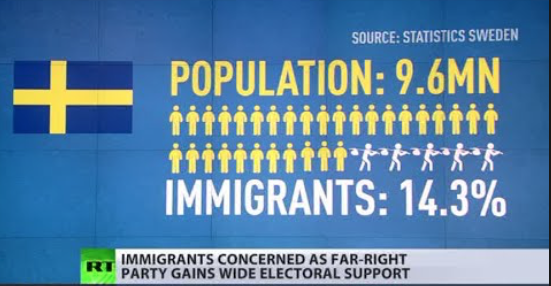 Immigration has become the most important issue for Swedish voters according to a survey conducted earlier in the year and as a result, many parties have tried to emulate the tougher policies of the SD. Holmberg added that the lack of popularity of current Prime Minister Stefan Lovfen, leader of the Social Democrats, may also harm the party’s support at the polls. “It’s not good for a government. The Prime Minister may not need to be number one, but he needs to be in the top half,” he said. This poll comes after another revealed that the SD was the most popular party with young voters aged 18 to 34, echoing trends across Europe in which young voters increasingly support anti-establishment parties on both the right and the left. It’s about time the ordinary people fought back against the political regimes that are destroying their countries. I thought Sweden was beyond repair, but this turnaround ignites a tiny glimmer of hope. Bring on the REVOLUTION, folks, and purge your societies of pisslam and all it represents- intolerance, inequality, fanaticism and violence. But it’s too late…. Don’t you think? Until and unless the native Sweds don’t increase their birth rates exponentially, they will be trailing behind Muslim baby making machines for decades, leading to an eventual Islamic Sweden…. 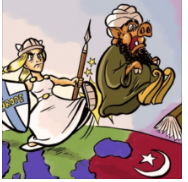 Like it or not… Sweden may become the very fist European country typo fall to Islam. Send the Mohammedans back. All of the “refugees.” Including the ones who are “settled” in the No Go Zones. Whatever it takes, round them up & export them. If you don’t know from where they came, divide them up & send them to the various possible countries. Send them home. Let all the liberals go their & help them there if they care. As for not having enough people? there’s no reason to say the world must continue to grow; & certainly not at the rate that Islm wants it to grow. Self – sustaining. Sweden was doing fine before. Its gone up.But ofcourse not so much. Only 15% will vote for the AFD or so. Why?The old people think the CDU/CSU is still a conservative party.And its the Nazi Hammer. 70 years of brainwashing-nobody wants to be called a Nazi-thats what they afraid of.And if you are not for Open Borders and Mass Immigration you are a Nazi-even if you spent money to Africa or rebuild a jewish cemetary. 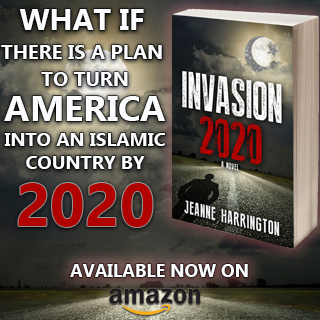 World War is coming……Islams army has been placed strategically in many countries around the world through migration just waiting for the signal to go forth and conquer. They are ruthless and evil and will kill everyone in a family right down to the demon possessed dogs that live with us. Mohammad feared and hated dogs and believed them to be demon possessed hence all the torturing and killing of dogs in the middle east. Merkle is as evil as they come and she will be on the side of the man of sin that is already here, just waiting to be made known. She is building a vast military and will use the muslim army already in her midst. LJW, you get it, it should be rather obvious at this point that war is totally inevitable, but so few seem to even have any interest in knowing what is actually going on in the world, it truly baffles me. Don’t you wonder how bad it will have to get before millions more slowly crawl out of their duped slumber? Lots of death coming….. in lots of places. Yes, so true. It is mind boggling and terrifying to see the storm on the horizon and the dogs of war running amok around us. And yet the vast majority of the World’s populace refuses to see. 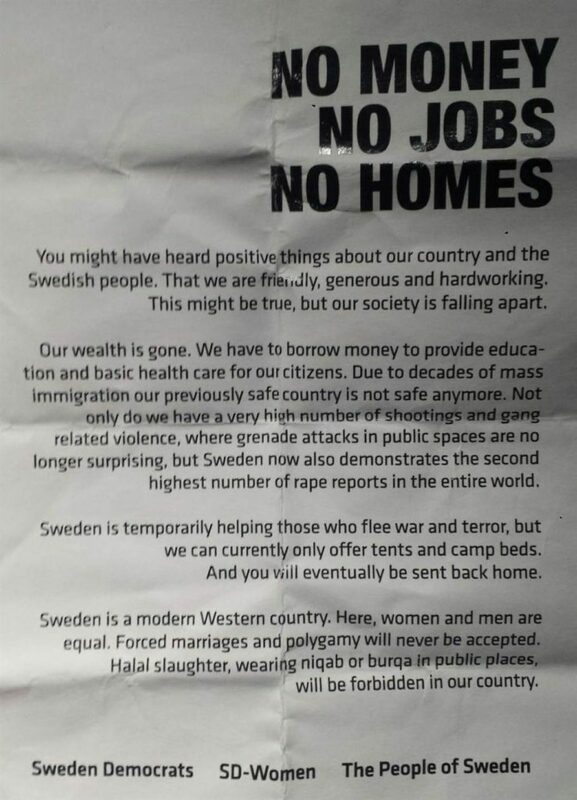 Sweden’s socialist safety net …. caught a boat load of rotten fish ? the country has been in for the last few years. Yes James, coming out of a coma maybe due to there viking blood has been awakened by another kind of barbarian. A religious intolerant barbarian to further emphasize. Hmm. Good results. Now I understood why it took too long for this things to happen. Filth purged too early would have left the people immature. Now they know by painful experience what Islam is . I think now in less than one year Islam will be rooted out of Europe. During this time let these Islamist give as much pain so that it will remain in their memory for a long time what Islam really is. Proud Kaafir what you said here about purging islam too soon makes sense. People often are a bit complacent in good times and it takes trials and tribulations to wake them out of that happy time sleep. Also good to see that the Swedes understand what islam is doing to them. I’d like to believe Swedes — or any Europeans or Britons — understand what Islam is doing to them. (What their governments are doing to them is more like it.) But I simply don’t. There is a daily tidal wave of the insanity of third-world immigration, Muslim immigration especially, but the electorates sit there passively and pass up opportunities to vote for nationalist, patriot, anti-immigration, anti-globalism, anti-diversity, anti-multicultural parties again and again and again and again and again. France had the opportunity to vote for Le Pen last time but instead went for some kind of mincing twit. Even now the SD in Sweden are just at 23%. Be still my beating heart. No need to get excited about anything in Sweden these days. No, sir. All the time in the world. Nothing says Swedish political stability like no-go Muslim areas and hand grenades tossed at police stations. Richard I understand why you have a pessimistic view of the islam problem in Europe especially Sweden. 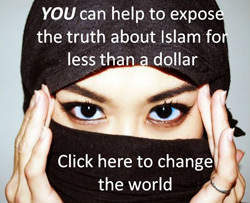 We have a great responsibility to inform people what islam is and why it must be stopped. If we fail this fight we are all living in 7th century conditions on pain of death. This is what awaits us if we fail to win this war. Sweden is finally coming to her senses? A miracle! Finally they have had enough of the Muslum mutant pig-monkeys disguised as human beings. This Jimmie dude looks good. However, Sweden still has a bad infection of Islam. Even if they do change their government/policies. However, the situation is so terrible and out of control with Muslims, that in order to save their nation, borders must be closed immediately and massive deportations began right away. If the Swedes need help with deportations, they can appeal to the world’s non-Muslims for help. They must be quick because the EU is going to have an EU army that will certainly act against patriots and Christians. Good to see you are here commenting on BNI again Linda. I feared the UK thought police got you to be honest. That EU army you talk about is a very ominous development. It will certainly be used to persecute patriots and followers of God the Most High. Not just that, I think if the EU army does arise it will be one of the armies that tramples Jerusalem when the man of sin pops up most likely out of Europe. Charles, I wasn’t commenting for about one month because I didn’t have internet access. From July 10, for about 3-4 weeks, I will again have no internet access. I have lived in America for many years. I wanted to return to England after being heartbroken years ago because of what the monsters have perpetrated on massive numbers of our young girls. I feel responsible to do what I can to help. Every day I am filled with great anger and grief over this. The problem is because of the massive importation of Third World Muslims by UK ruling elites who are immediately gifted with free homes, this has made trying to get a place to live very difficult and very expensive. No problem for the huge Third World!! It is already planned to build specially for them large numbers of FREE homes! Huge numbers of homes go to migrants instead of to the native Brits who need them and pay the taxes! Linda I also hail from the UK and it also breaks my heart hearing about what islam is doing to them. Those European and UK leaders have decided that they don’t want native Europeans and Brits to rule over. So they flood it with 3rd world muslim horde invaders despite knowing what horrific crimes will result from this. Anyway keep safe and the Lord protect you. I am not optimistic about Sweden and their chances of turning this around. African/muslim scum will not give up without a fight. War with them is the only answer in my opinion. I do not think the Swedish people have the stomach for war and taking their country back. They are too liberal and weak. Could I be wrong? RP, I have been following the Sweden Democrats for several years now and have posted several positive stories about them. But just a year or so ago, the media was writing them off as having no support anymore because the number of muslim migrants coming in had dropped a lot. So seeing this story, was a huge surprise for me. Uk and germany will certainly wake up. It’s the UK that’s hopeless. There are so many cousin marriages within the British Pakistani community. And the Muslims also practice polygamy as well. These people need to be deported if they don’t abide by their HOST country’s law. The UK takes the pressure off by electing Muslims to positions of real power over the majority kafir population. Christian detesting Pakistanis seem to be the favorites by far. The When Muslims have the numbers to demand partition at least they will be trained. Jesus wept. In Germany the mainstream media take care of the citizens being kept in an amnesia. That’s the main problem compared to countries still intact like Austria and Switzerland. There are no families in islam just termite mounds of terrorism translates into Swedish – unfortunately Germany is even more “cucked” and it does not effectively translate into German. yeah, not bad enough when 2000 women raped in Cologne new years eve a couple years ago, not bad enough when Jewish girls are raped and murdered and GERMAN girls too….i really wonder about Germans. But then, I had better shut up. Sweden needs to be courageous to fight the forces of political correctness and take the country back. They can pay the Moslems to go back. Here lies the problem: political correctness. The left advocates for ‘tolerance’ towards Muslims and how we have to not be racist towards them. There IS one way to fix this. For those who preach tolerance and how racist and Islamophobes people are, why not have a leftist liberal LIVE with a Muslim for one day? Have THEM experience it for themselves and see how they like it. Once they learn their lesson the hard way, then they will understand. With some people, they need first hand experience in order to finally ‘get’ it. Otherwise, they will never get it if they live in a bubble. BTW, Samhällsnytt now has the Sweden Democrats at 28.5%, while the Social Democrats have fallen to 22%. Too little too late, even these people seem about halfway apologetic that they have to do this. Where is the reason and resolve? Are these liberals still on the GLOBS band wagon? I suspect so, is there a true Christian conservative in the pitiful place? On the other hand it is beyond me why a country like Germany is virtually the only place where these parties don’t do better in polls. Apparently it is not going bad enough yet. Well stick around, it can only get worse with a country full of moslems! But back to Sweden, where all the other parties combined to lock out the Sweden Democrats, very like the Netherlands where the other parties will do anything to keep Wilders and his party out. Eurabia has more traitors to the square inch than you can shake a stick at! Germans are the most stubborn.